Energy theft is one of the costliest types of theft in the world. According to a 2007 report, the FBI and International Utilities Revenue Protection Association estimated that losses due to energy theft are at $6 billion in the United States alone. Both traditional analog meters as well as the more advanced meters used to monitor energy consumption are susceptible to theft. Traditional analog meters are susceptible to the “rollback” technique, where the meter is opened and the dials are manually rolled back. The most common form of energy theft in developing countries involves bypassing the meter entirely by tapping directly into the distribution cable so that energy use cannot be monitored. To detect and prevent these different types of theft, energy firms need to be able to continuously monitor for tampering, energy reversal, or voltage fluctuation events so as to be able to immediately dispatch a field technician to the meter in question. Forward-looking energy and utilities firms are evolving their infrastructure from traditional analog meters to an Advanced Metering Infrastructure (AMI), wherein meters report how electricity is used at different times of the day and where the meters can be read and controlled remotely. Modern energy theft with “smart” meters can involve remotely hacking into a smart meter from an IP address, or simply changing the meter’s parameters. As smart grids become more interconnected, the number of access points increases as does the number of potential points of vulnerability. For smart grid operators, the real challenge lies in maintaining the security of a dynamic and growing network. Network intruders are becoming increasingly adept at stealing credentials, identities, and ultimately energy by hacking smart meters as well as other data collection and monitoring devices on the network. Smart grid security solutions must evolve to detect changes in expected user behavior. Typical signature-based security solutions are vulnerable to identity theft, failing to detect hackers who impersonate authorized users to access non-routine systems. However, a behavioral-based solution would continuously check for any reversal of energy and correlate it with user information to check for potential fraud and send real-time alerts to authorized personnel. Behavioral-based detection looks beyond “who” the user is to also identify “what” that user is doing and “when” and in which context. 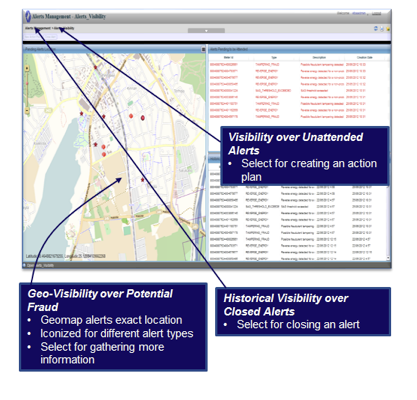 Vitria OI provides continuous, real-time analytics over the data and events across the grid. The real-time capabilities of Vitria OI enable instant responses to threats using proactive – not reactive – threat detection and resolution. Vitria OI conducts continuous, real-time behavioral analysis on potential intruders. Vitria OI can stream in information from multiple systems connected on the grid to display customer account information together with a history of consumption at a particular location. It can quickly tap into data from a variety of sources, correlating and analyzing real-time events with historical data, to compare a customer’s behavior to baseline reference data. With Vitria OI, smart grid operators can instantly identify unusual trends and patterns and proactively detect and act on security breaches.